UK fishermen tell locals of their experiences in Europe with offshore wind farms and how to organize. As global wind-energy interests set their sights on more than a dozen offshore U.S. energy areas, two longtime British fishermen who act as go-betweens to the offshore wind industry and the fishing community advised Long Island fishermen to stay vigilant and demand a seat at the table when waters are divvied up. 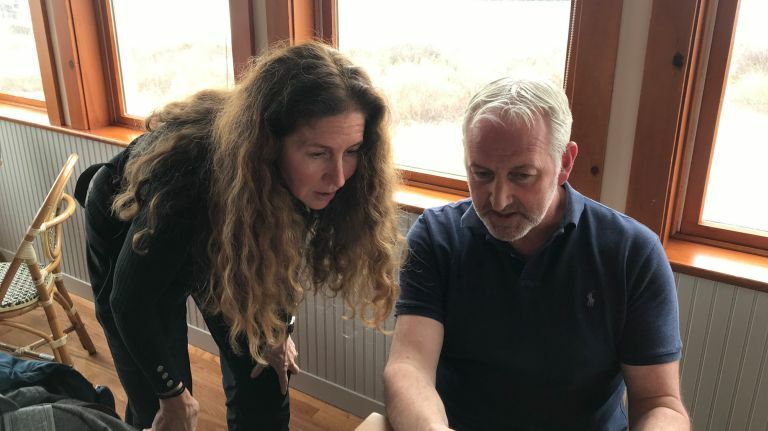 Two dozen Long Island fishermen gathered in Montauk Monday to hear how two veterans of Europe's maturing offshore wind industry worked to bring their industry into discussions on siting projects in waters that have traditionally been their workplace. It hasn't been easy, and successes have come only recently, they said. Colin Warwick, chairman of the Fishing Liaison Offshore Wind and Wet Renewables, Crown Estate, said U.K. fishermen were initially caught flat-footed when wind-energy developers first started planning turbines for their fishing grounds. It’s taken time for fishermen to demand a seat at the table so that prime harvest grounds aren’t lost, and so that fishermen can be compensated if even temporary work limits access to those grounds. U.K. fisherman Merlin Jackson, a fishing liaison officer for the Thanet Fishermen’s Association, said a 100-turbine wind farm in the Thanet fishing grounds was “an example of how not to build a wind farm” from a fishermen’s perspective. He noted that the initial 100 turbines were spaced around 500 meters apart, making it difficult for fishermen to fish among them. “There was no process for engaging the fishermen whatsoever,” he said. Things have changed with more recent projects. “After that we got very involved,” including plans for an extension of Thanet, Jackson said. The European wind industry has had a more than two-decade head start over the U.S. market, which is heating up with more than a dozen major proposals that could put projects in federal waters as soon as next year. The U.S. Bureau of Ocean Energy Management is expected in coming months to announce a series of new wind-energy areas off Long Island, with an auction for sites expected next year. Acting BOEM director Walter Cruickshank, in an interview, called waters off Long Island in the New York Bight a "very conflicted area," with "a lot of different uses out there," including commercial fishing. "There's a been a great deal of interest." The agency, like New York State, has created avenues for participation for fishermen to weigh in on siting of areas, as have some wind developers. Bonnie Brady, executive director of the Long Island Commercial Fishing Association, said challenges continue. "We're fighting on everything and we're united as a group, but we can't seem to get teeth in because wind farm companies keep saying, 'I can't hear you.' "
Norway-based Equinor already has a proposal for its lease of nearly 80,000 acres off Long Beach and New York State in coming weeks or months is expected to announce the first 800 megawatts of a potential 9,000 megawatts of wind power for the state, with turbines likely to be placed throughout much of the fishing grounds off Long Island.